It was wonderful — I came back with lots of new ideas and energized to move ahead on a number of initiatives. I really like the mixture of big successes in the keynotes with the smaller sessions that are more focused on inquiry and process. You have put together a winning formula. Thanks for giving me an opportunity to participate in this terrific event. This experience opened my eyes to a wide range of Web analytics measurements that go far beyond page views, unique visitors, and clickthroughs. I now believe that Web analytics is best served by a combination of metrics sources, including even “soft” measures such as buzz monitors (which I learned about there). 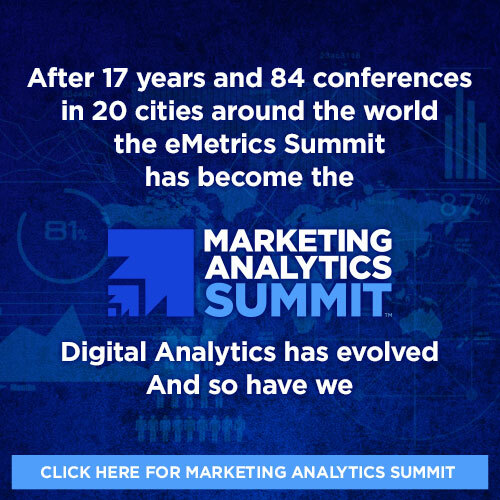 Since attending eMetrics,, I have subscribed to a number of RSS feeds of blogs, forums, and news — all about Web analytics. I look forward to reading them almost daily, and learn something every time I do.